Do you need to cut a wide variety of thin materials on a budget? MultiCam’s 1000 Series CNC Waterjet is the perfect platform for accurate and quality cuts every time! Cutting with a Waterjet is beneficial for heat-sensitive processes as it does not create any heat-affected-zones which could potentially lead to warped material. MultiCam’s EZ Control G-Code and Coreo software ensures a simple yet effective workflow for machine novice and experienced operators alike. Combined with Coreo, an intuitive CAD/CAM software, businesses will have the ability to draw, program, and cut within the same program. With a cut speed of 1,000 IPM and a rapid traverse of 1,200 IPM, the 1000 Series Waterjet provides quality and reliable cutting. Since the jet-stream of water is so small, the kerf (line of cut) is minimize so businesses can get the most parts out of their material to maximize production output. With over 25 years of CNC experience in designing, manufacturing, and applications MultiCam is up to the challenge when it comes to finding a production solution for you! For more information about the 1000 Series Waterjet or any other of our CNC machinery, contact us at [email protected] or give us a call at 972.929.4070 today! If you need to cut a wide variety of materials, you’re in the right place when looking at the Multicam 3000 Series CNC Waterjet. With waterjet machining, you get an impeccably accurate cut without an edge impacted by heat. EZ Control G-Code and EZ Suite software ensures smooth and accurate operation by all your employees. Forklift tubes are built right in the 3000 Series for easy transport. Also, if you need to make a pure water cut that doesn’t require abrasive, you can make the transition fast. You get 8 different options for customization to choose from so you can meet all your cutting applications. With a cut speed of 1,500 IPM and rapid traverse speed of 2,100 IPM the 3000 Series Waterjet works quickly enough to get your project done by your deadline, without sacrificing cut quality. But, the real reason you’d get the 3000 Series CNC Waterjet is for its versatility in cutting applications. You can cut any material accurately, and without a heat-affected edge, ranging from steel to stone or plastic. And you can cut for any industry, starting with simple sign making and structural steel and getting as precise as aerospace. When you get the 3000 Series CNC Waterjet, you also get MultiCam’s immaculate customer service. Call MultiCam at 972.929.4070 to get your questions answered today. You won’t face any high sales pressure. Just get the facts so you can make the best decision for your company. Our manufacturing facility utilizes laser calibration equipment, so you don’t have to second-guess the accuracy and performance of a MultiCam system. With such an advanced system, this 5000 Series CNC Waterjet is perfect for end-users requiring high-performance and precison. Constructed of an all steel frame means that you have a solid and sturdy frame which nearly eliminates vibration. This durability helps cutting even the most intricate of parts accurate and clean. Coupled with MultiCam’s EZ control system, this CNC Waterjet system is offered with a 60,000 or 90,000 PSI pump to help maximize your throughput and speed throughout the cutting process. Contact our sales team at 972.929.4070 for more information or to find out what system works best for you! Don’t have a large budget, but do need to make highly accurate cuts for aerospace, automotive, HVAC, marine, stone cutting, or general metal fabrication purposes? The 6000 Series CNC Waterjet may be just the solution you’ve been looking for. It’s been specially designed to accurately cut a wide variety of materials at high speeds. And of course, since you cut with water, you get an excellent finish without an edge damaged by excessive heat. All manufacturing’s been done with certified laser calibration equipment, so you don’t have to second-guess the precision level. That also means your customers can count on high work quality too, which means they’re happier. Modular base rails have been made from ½” thick structural tubing. This means you have an extremely rigid cutting base, which nearly eliminates vibration and keeps your cutting quality high. The 6000 Series CNC Waterjet also runs much quieter (and especially so at higher speeds) than a rack-and-pinion system because of the Alpha gearboxes and precision manufacturing the machine frame. The helical rack also has many more engaged teeth than your standard straight system, and that helps the CNC Waterjet accelerate faster and cut more accurately. The rapid-traverse moves so quickly that your customers will even notice if they stop by to see you working in action. Add on top of this MultiCam’s EZ control system, which does just like it sounds, and you have a winning combination for quality, accuracy, and consistency. Just call our sales team today at 972.929.4070 to ask all your questions to get straightforward answers, without any high sales pressure. The V-Series CNC Waterjet may be just the solution you’ve been looking for. With the V-Series, you can make pure water or abrasive cuts. To maximize your productivity, the V-Series CNC Waterjet comes with multiple heads so you can simultaneously machine parts. And, you can accurately cut just about anything you want. Cutting applications range from steel to galvanized metal, stone, glass, and plastic. You can cut for nearly any common application, including manufacturing HVAC equipment, making signs, or making automotive parts. A KMT Tri-Line Pump is an affordable solution that creates up to 55,000 PSI in operating pressure to make your cuts happen. Manufactured with the idea of requiring less maintenance, it’s also easily accessed when necessity dictates. The V-Series CNC Waterjet also comes with an optional closed water filtration system, abrasive removal system, or intensifier ranging in power from 30 HP to 200 HP. When you choose the V-Series, you also get MultiCam’s reputation for amazing customer service. With more than 70 locations in our global network of experts, MultiCam is easy to access when you need help. Call our sales team at 972.929.4070 to learn more about the V-Series CNC Waterjet and see if it is right for you. You won’t get a high-pressure sales pitch. Instead, you’ll get friendly assistance to help you make the best decision for your company. Equipped with standard features you normally only get with more expensive MultiCam CNC Plasma cutting machines, the CNC Modular Plasma Cutter 1000 Series makes the perfect fit for an entry-level manufacturer looking for an economical, yet high-quality, method for cutting. With the CNC Plasma 1000 Series, you get easy control, the ability to cut for a wide variety of applications, and the full support of the global MultiCam Technology Center network. You also get MultiCam’s Integrated Material Database, which speeds up your cutting processes. Normally, when you change the type of material you have to cut, you have to spend time adjusting a variety of parameters like feed rate, pierce delay, pierce height, and many others. The Integrated Material Database integrates most of these into a simple menu system that adjusts these values for you. The leg stands are made from 4” x 4” x .25” structural steel and get mounted to the floor for additional rigidity, which reduces vibration and improves cut quality. The 1000 Series Bridge & Rail also has hardened and polished carbon steel rails with 1.80” diameter wheels, with each wheel able to support up to more than a ton – 2,057 lbs. Lastly, the Bridge & Rail cutting system exclusively uses Hypertherm torches. You get high cut quality at half the operating cost. Learn more about the CNC Modular Plasma Cutter 1000 Series Bridge & Rail today when you call our sales team at 972.929.4070. You won’t face any high pressure. Simply find out if the 1000 Series Bridge & Rail Modular Plasma Cutter fits your cutting needs. The 1000 Series CNC Plasma cutting system makes for the perfect fit for businesses that need high performance at an entry-level plasma price. A solid steel frame means the 1000 Series has minimal vibration and excellent precision. The 25 mm linear ball bearing rails increase this stiffness even further. Automatic tool calibration means you save more time and spend it increasing your productivity by cutting instead of configuring. The precision X-axis two phase high speed stepper motors aid in cutting accurately, and require virtually no maintenance. The z-screw assembly uses a 1/2” diameter stainless steel lead screw. It’s held in place so it can bear high axial force loads. Lastly, a brass nut helps carry the Z-axis load. If budget is your concern, you can go with a manual clamping surface in the aluminum t-slot table option. You can also choose medium-pressure phenolic grid tops. Adjustable leveling fleet help you hold your work surface and project stable for precision cutting. Lastly, the 1000 Series CNC Plasma comes with MultiCam’s world-renowned reputation for excellent service. With locations across the globe, you always have help nearby. Contact our sales team today at 972.929.4070 to learn more about the 1000 Series Plasma and its customizable options. Weight: 2,612 to 4,988 lbs. Need a machine-tool quality CNC plasma cutting system? Then the 3000 Series Plasma was made just for you. With a sturdy and rigid all-steel plate frame, you can easily support any standard or high-definition plasma unit you need. The heavy-duty steel frame also means you experience almost no vibration when cutting, which means you get a highly precise cut every time. Corners won’t cost you serious time when you make those cuts because of the high-speed contouring system you get with the 3000 Series Plasma. The downdraft table takes care of all dust and debris so you have a clear working space and can do the best job possible. The 3000 Series Plasma also comes with the integrated material database. When you switch the type of material you’re cutting, you have to use valuable time to set many other parameters like feedrate, pierce delay, pierce height, and others. With the material database, you simply select the material to be cut and these parameters adjust automatically. The 3000 Series Plasma also comes with a remote controller. You can control the machine remotely by setting job parameters, performing tests, and downloading jobs. A Productivity Software Suite is also included to ease operations. And of course, it all comes with MultiCam’s world-class customer service. We have many locations worldwide, so help is always nearby. Call our sales team today at 972.929.4070 to learn more about the 3000 Series Plasma and see if it’s the right fit for your production needs. Weight: 1,900 – 11,800 lbs. The 6000 Series CNC Plasma is designed specifically for manufacturers who need to cut heavy plate or want a large process area. But, you don’t have to sacrifice cut accuracy or quality! With a motion platform independent of the cutting surface, the 6000 Series does not experience damage from materials being loaded or from intense heat caused by oxyfuel cutting. Customers report increasing their production capacity by being able to run the 6000 Series for 19 hours per day, up to 6 days per week. 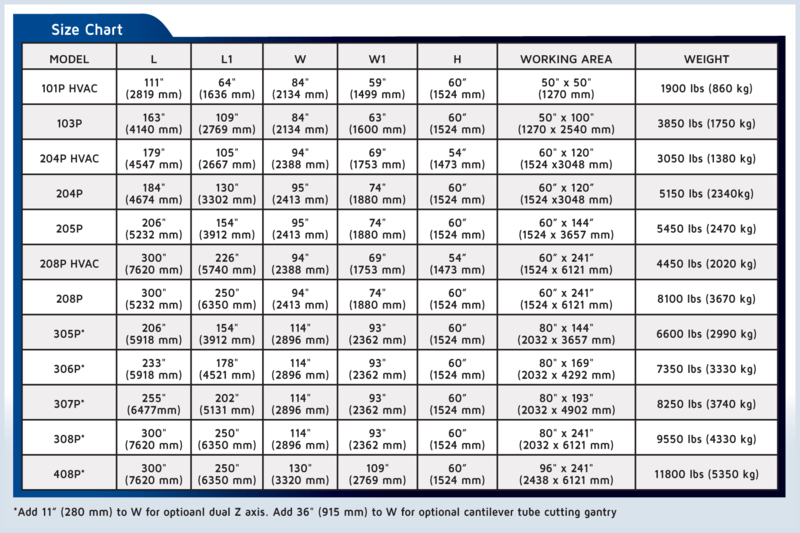 With the 6000 Series CNC Plasma, you simply can’t beat the number of features you get to help you make precision cuts. To increase your productivity, the 6000 Series CNC Plasma includes an integrated material database. So, instead of changing feed rate, pierce delay, pierce height, and many other options when you change the material, you simply use a menu-drive system that adjusts most of these settings automatically. You also get an extremely rigid base that reduces vibration and keeps your cutting quality high. Finally, the gantry is made from 1.5” steel plate, which also helps reduce vibration and improves cutting quality even further. And just like when you choose any MultiCam cutting system, you always get access to world-class customer service. With more than 70 locations in our global network of experts, we’re always just a short distance away. Call our sales team at 972.929.4070 today to learn more about the 6000 Series Plasma. Since the motion platform is independent of the cutting surface, the Arcos Bridge & Rail Plasma does not experience heat damage normally associated with the Plasma or Oxy-Fuel (Acetylene) cutting processes. The Arcos Bridge & Rail Plasma is a host to multiple features, you simply can’t go wrong when it comes to this fabrication machine! This system features an integrated material database so you can simply use a menu-drive system to adjust feed rate, pierce-delay, pierce-height, and many other options automatically. The Arcos Bridge & Rail is made up of an all steel construction which is extremely rigid and reduces vibrations to keep your cut quality as pristine as possible. As always, choosing a MultiCam CNC system provides you with world-class customer service and support before and after sale. With more than 60 locations in our global network, service and support are always within reach. Call our sales team at 972.929.4070 today to learn more about the Arcos Bridge & Rail Plasma. The V-Pro Series CNC Plasma works perfectly for cutting a variety of metals including mild and stainless steel, aluminum, brass, and copper. Whether you do a wide range of jobs, signs, or fabricate marine, automotive, or oil field equipment, the V-Pro-Series CNC Plasma gives you a precision cut. The V-Pro Series exclusively features an all-steel water table with water-leveling bladder. This gives you a level of precision cutting you simply can’t find with any other plasma cutting system. The water table also eliminates the need for any fume evacuation, which makes it capable of accurately cutting 1.25” / 32 mm thick material. Hypertherm cutting torches offer a wide cutting capacity. They have an impressive consumable life. The V-Pro series uses Hypertherm’s MAXPRO200, which is specifically engineered for heavy-duty mechanized cutting. The standard automatic torch height (ATH) control gets automatically adjusted based on the cutting parameters set. That eliminates the time and planning you may need to make otherwise. The V-Pro Series also has an optional plate rider that allows you to cut sheet metal. Finally, the V-Pro Series also comes with MultiCam’s excellent reputation for customer service. With locations across the globe, you always have a support technician nearby ready to help. Call our sales team today at 972.929.4070 to learn more about the V-Pro Series CNC Plasma cutting system, and how it can help you make the precision cuts you need. Value Line Series Keypad Interface includes MultiCam EZ Control and EZ Suite software. The MultiCam V-Series CNC Plasma cuts with precision through a variety of materials for many common applications. Sign shops, marine fabricators, and machine and auto fabricators will love the V-Series’ ability to cut through mild and stainless steel, aluminum, brass, and copper with minute precision. The base frame is made of welded steel with stringers fabricated from aerospace-grade aluminum. Reinforced steel leg supports work together with all this to ensure a high degree of rigidity, minimal vibration, and – precision cutting. Like the frame, the gantry is also custom-engineered for max stiffness and rigidity. The extrusion has a tough wall thickness of 4.75” x 5.70”. Castings support the gantry, giving it an almost extreme level of stability. Every MultiCam V-Series CNC Plasma comes with a Hypertherm cutting system. The PowerMax torches offer a wide cutting capacity on aluminum and mild steel with the V-Series. They also help you get excellent consumable life with air or oxygen. You also get automatic torch height (ATH) control. Based on the current cutting parameters you have set, the torch height gets automatically adjusted. This saves you a fair amount of time when you have to cut many different metals. Finally, no matter where you’re located you’re always close to help. MultiCam has locations across the globe with technicians eager to assist. To learn more about the V-Series CNC Plasma and see if it’s the right fit for you, call our sales team at 972.929.4070 today. Capable of cutting a wide variety of materials, the Magnus CO2 Laser system is one of the most cost effective and flexible CNC solutions to get the job done. Want to learn more on how the Magnus CO2 Laser can significantly lower your operating costs and earn a fast payback? Contact our knowledgeable and friendly staff at 972.929.4070 today! Improve your ROI within a remarkably short period of time with the Quantus Fiber Laser. With faster speeds than Plasma and a higher precision than Waterjet, the Quantus is priced well below other traditional Fiber Laser solutions, without any sacrifice in quality. As a low maintenance CNC solution, the Quantus Fiber Laser effectively reduces high labor costs and nearly eliminates having to replace regular consumable parts associated with expensive Laser systems. This helps keep your expenses down and your production at an all time high. With power levels starting from 1500 Watts up to 8000 Watts, there is a Quantus to fit your budget and production needs. Cut through nearly any type of metal quickly and easily with a high range of precision and accuracy. Coupled with MultiCam’s advanced and easy-to-use CNC control software allows your employees to efficiently integrate the Quantus into your workflow. Because of its versatility, the Quantus Fiber Laser is the most advanced, industrial grade and cost effective Laser cutting system on the market. With a long rated Laser life of up to 100,000 hours, spend more time improving your throughput and less time setting up the machine. In addition, the Quantus Fiber Laser is backed by MultiCam’s world-renowned reputation for quality customer service and support. With 60 technology centers across the globe, you’ll have qualified service and support associates near you. To learn about how your business can capitalize with a Quantus Fiber Laser, call MultiCam’s friendly and knowledgeable sales team at 972.929.4070 today.